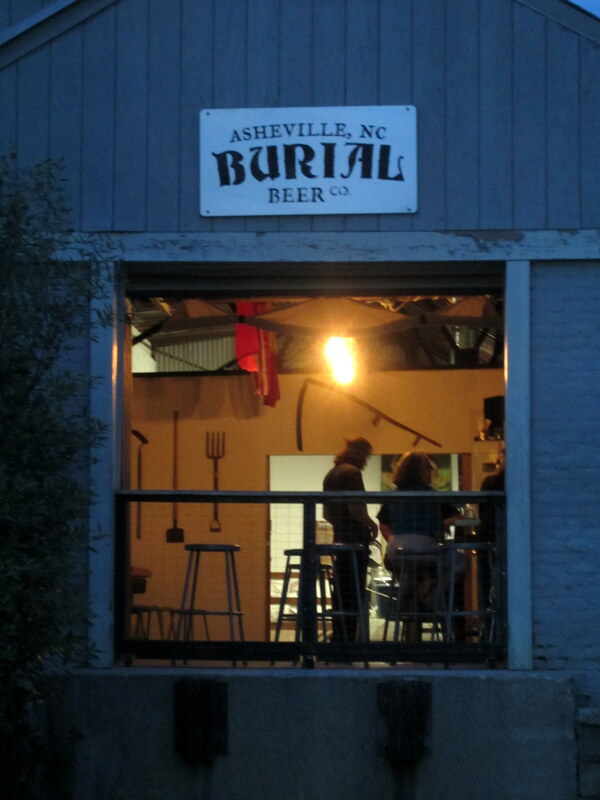 Our next stop on the Asheville Ale Trail was Burial Beer Co., which is located less than 500 feet from our previous stop, Green Man (head east on Buxton and take the first left onto Collier). 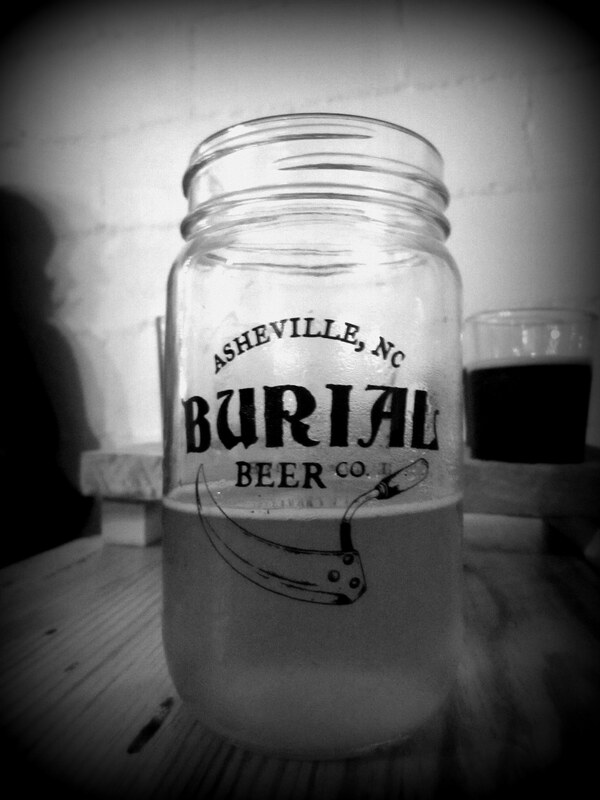 Burial is a nanobrewery that makes a rotating selection of small batch beers. They first opened in June of 2013, which makes them about a year old. Our decision to visit Burial was based simply on its proximity to Green Man, so we approached the brewery without any expectations for this place. My first impression on seeing the brewery is that we had stepped through a portal and had been transported to a barn somewhere in rural North Carolina. That impression was not dispelled by the fact that the bar stools looked like they came straight from my high school shop class and the inside is decorated with old time farm equipment like scythes, spades, and pitchforks (it turns out that is the theme they use to name their beers, more on that later). Bob Dylan covers were playing on the sound system, several of which were rarely heard favorites of mine. The bar stools were full and there were a few other people seated at tables scattered around the place. Are we still in Asheville Toto? The illusion that we were transported to a backwoods farmhouse was shaken somewhat by the fact that none of the clientele looked as though they were familiar with the inner workings of a tractor. It was dispelled completely when I saw they served styles like a coffee infused saison, a coconut brown ale, and an oatmeal pale ale. The farmers I grew up with back in Idaho are an unlikely target audience for those kind of “fancy beers”, but hey maybe North Carolina farmers are cut from a different cloth. It’s worth noting that their taproom is only open on Thursdays, Fridays and Saturdays. I would also add that the bartender told me that she thought one of the owners, Jess, was a graduate of Ohio State University (where I work). I wasn’t able to verify that fact though. We invite our loyal beer drinkers to partake in experimental beer drinking. As we start out, we will be implementing new recipes and tweaking old ones. We will pour special releases almost every weekend and the beer you had two weeks ago, might have different hops or an adjunct that wasn’t in it before. Consistency is very important to us, especially once we are brewing on a large production scale and distributing near and far, but for now, we want feedback from YOU while we perfect recipes and indulge our creative side. Like Wicked Weed the beers were innovative and for the most part very good. Here are some brief tasting notes on some of the beers that we tried. As you can see all of the beers are named (loosely) after different pieces of old time farm equipment. Spade Session IPA (4.7% abv, 35 IBU) – A hoppy, refreshing session IPA, that was even better than the one we tried at Wicked Weed (Sweet Talker). This was my friend Andy’s favorite beer of the night. Spoon Oatmeal Pale (6.3% abv, 37 IBU) – Easy drinking and tasty. The oats lend a smoothness to the mouthfeel that is unusual for a pale ale. Nice hoppy flavor, very restrained bitterness. Very drinkable. Thresher Coffee Saison (4.6% abv, 22 IBU) – This is the one that sticks out most in my mind. They start by brewing a Saison and then add Bolivian coffee post fermentation. It’s a golden ale that looks like any other Saison, but there is a boatload of tasty fresh coffee in the aroma and taste. If I could try any of their beers again it would be this one. Corned Cob Smoked Porter – The smoked malts give a distinct smoky taste that is balanced nicely with chocolate flavors you expect in a porter. As far as smoked ales go this one is well executed. Cultivator Black IPA (6.3% abv, 60 IBU) – You get dark chocolate from the roasted malts together with citrus fruits and pine from the Northwest hops. The point of a black IPA is that both malts and hops contribute to the taste and here they’ve hit a good balance. Battleaxe Belgian Strong Ale (10.5% abv, 57 IBU) – This is a dark strong Belgian-style beer made with hops from France and New Zealand. For my tastes this one was way too sweet, borderline undrinkable. 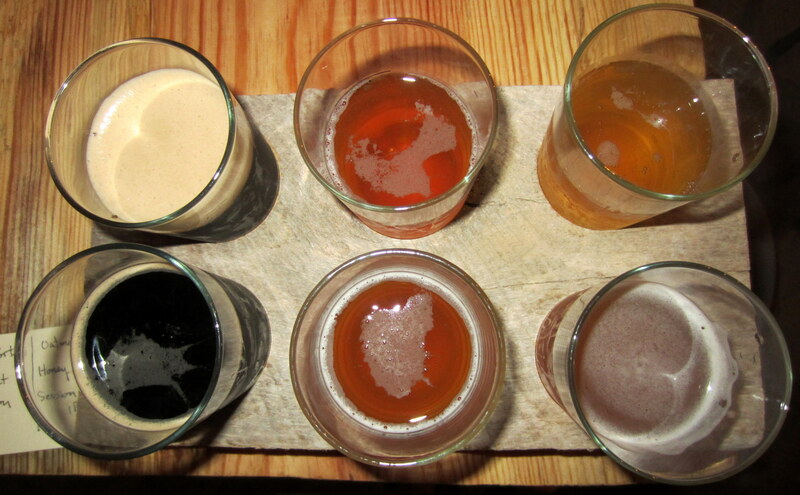 Sampler tray, clockwise from upper left: Corn Cob Smoked Porter, Thresher Coffee Saison, Cantilever Honey Melon Blonde, Spade Session IPA, Spoon Oatmeal Pale, and Cherry Stout. I’m excited about finding this hidden gem. In terms of making tasty and interesting beers I’d say Burial gives Wicked Weed a run for their money. There are a few misses, but mostly they’re nailing it. When you combine quality beers with the casual atmosphere of a nanobrewery it’s the best of both worlds. Overall it was my favorite stop of the trip. According to their website Burial’s plans are to expand after a couple of years perfecting their recipes. If their business acumen is anything like their brewing skills I expect to be hearing more from this brewery in the future.